Our Dubplate Sessions have always been something we look forward to [the most], given that it's been a long long hiatus, we couldn't be happier to share the news that we are back with it! This time, we have the brand new name in town, Nmakz [Nikhil Maka] with us. Recently back from the UK, after completing his Masters, we found this guy with an impeccable taste, via a friend's [Beatworx] studio sessions. Having done a couple of gigs in the city with us now, displaying a fine show each time, he belongs from the science background which if we may say - is a stark contrast to the usual music life. And thus, we couldn't wait to see how and what pulled him into the 'Jungle' world, and what does he have in mind for the near future. Read, get to know him a little more, while you listen to this exclusive set by him, which has some of our personal favorite tracks. 1. Nikhil, how are you doing? Glad to have you on board with us for #BassMondays. To begin with, tell us a little about you as Nmakz? How long has it been that you have into DJing? A - Things are great here, glad to be on board with Drum & Bass India! I would say Nmakz wouldn’t be around if it wasn’t for my experiences in the UK, off which I am a product off. I started off DJing in 2011 as how many would have done on Virtual DJ. Then got hold of my first pair of Technics a year later, after which I have never looked back. 2. You finished your college in the UK [not so long ago] and have come back to the motherland. Did spending time there had anything to do with your specific interest in DnB/Jungle? A - My visit to the UK in 2009 was purely for education purposes. I have a keen interest for Science and Research, hence I decided to pursue a Physics undergraduate degree. The whole DnB/Jungle scene for me tagged along quite nicely I would say. Made a progression to the genre from being a prior fan of Rock and Metal. It was just a matter of stumbling across like-minded people at university and they happened to know a few regulars at a couple of raves, and that’s how my closely knit group of DJs/friends were formed. 3. You have played a couple of gigs and radio shows [Jungletrain] in London, how did all that come through and how was the experience? A - Wasn’t able to play out much due to University work at hand, but fortunately I was able to play for two radioshows and an X-mas edition gig for this spectacular group of DJs/artists known as Beautifully Crafted Jungle. They were friends of a close friend (fellow like-minded ravers) who decided to start a Facebook group back in 2012 under the same name. Their main goal at the time was to spread awareness on and promote old skool Drum & Bass/ Jungle music which they felt didn’t have a good platform yet for being shared to the masses. What started off as a small group of 100-200 members has now reached over 21,000 (with some notable members such as DJ Optical, Dom & Roland and more)! In-fact the founders have a good network in place with a handful of renowned artists/DJs and also have their own events transpiring once every 2 or 3 months. Anyone wanting a unique education on the old skool flavours of Dnb/Jungle and new music coming out on fantastic labels the past few years, check out their page/group! Much love and respect to my Beautifully Crafted Jungle family! 4. What's your personal take on difference between the bass scene between the two places? Any thoughts on the global bass scene? A - Drum & Bass in the UK has had plenty of time to evolve since its birth during the early 1990’s. In India however I feel it is still an emerging genre while being overshadowed by House, Techno, and Rock. But from my experiences here so far, I can tell that the DnB scene here is progressing fast! Couple of years ago I attended a Alix Perez gig here in Bangalore, and been seeing more familiar artists heading down to India so that surely is a great sign. Also, in the last two months I have been humbled to meet fellow DnB DJs – TheUntitledOne and Watashi, who are promoting the genre well in this city. I’m sure there are more names I need to get accustomed to so hopefully I find out more in the upcoming months! 5. You've a Science background [Undergrad in Physics and Masters in Nanoscale Science and Technology to be particular], are there moments when you relate the science bits with that of music? If yes, then how? A - I can’t really think of a direct correlation between science and music if that’s what you mean, other than the rules of physics followed by those sound waves coming from that next gnarly bass you are listening to. But a habit of mine is to constantly research about different topics in science, technology, healthcare, etc which I love to do on a daily basis; so I also implement this researching routine of mine with my never-ending journey in searching for good music. Also a lot of the drum and bass I listen to from the late 1990s tended to use plenty of science fiction / dystopian elements in their music production. For example if you give these tunes a listen: Dillinja – Silver blade / Ed Rush – Technology, you’ll notice samples taken from Bladerunner (1982) & Predator 2. If you havn’t seen those films, sort yourselves out this weekend! 6. Since you work/day job [at a tech solutions startup] doesn't revolve around music, how do you find the time to keep yourself updated with the music world? Any specific process you follow when it's time to prepare for a gig? A - Well, I try to have a daily routine of spending at least 30 minutes of discovering 2 or 3 good tunes regardless of the workload. It’s always therapeutic for my mind to take a break and discover new music. On the gig preparation front I almost never have a fully prepared set, but I try to keep the first two tunes of the set ready and the rest is a mixture of a light and dark tune selection depending on how the crowd is reacting. A - I am asked this often and unfortunately, I sold my speaker system and Technics 1210s (a turntable each to two of my close friends in the UK so I’m sure they are being put to great use) - I always joke about coming back for them sometime in the near future, so they best be prepared (laughs). 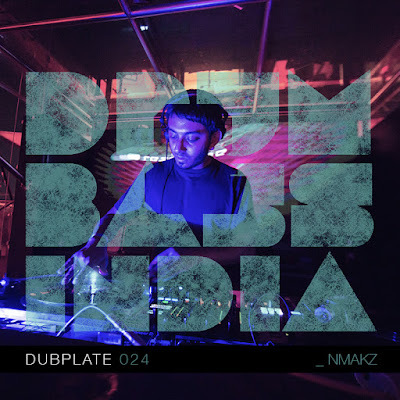 But yea, due to my focus on my work and these gigs I have been getting thanks to DnB India and Junket events; I feel quite satisfied with my current situation as long as I have somewhere to spin my records from time to time. 8. We've heard about your vast Vinyl collection, when did it all start? What's your best pick/buy till date, maybe an interesting story behind it? A - It all started during the summer after wrapping up my first year of my Undergraduate degree in London. Me and the amigos had been mixing on Virtual DJ via controller for quite some time until we parted for the summer and I was back in India for a couple of months. I get back for my 2nd year only to find out that one of my closest friends had upgraded to a pair of Technics 1210s! At that moment it was an immense shock to see the sudden change in hardware for our next group mix…and what do I do? Obviously get myself a pair a year later after saving some money!! Since then (2012) my vinyl collection has gradually been growing. There is nothing like the feeling of owning a tune in its physical form. Hmm always a difficult pick but one of my favorite vinyl which I hold dearly is a copy of Suburban Knights (Dillinja) – As it Grooves (1994). I remember bagging it for 20 pounds on Discogs a couple of years ago. At the moment there are 2 copies left on the site and they both go for 80-90 pounds. 9. How’s 2018 looking for you? What’s your plan? More gigs? A - 2018 is looking like a promising year so far! Yes hopefully many more gigs to come and people to educate on the various flavors of Drum & Bass. I can’t describe enough how much I love expressing myself through my music, so let these good times roll! 10. Can you list 3 tunes you are feeling right now. A : Tom & Jerry – Air Freshener.